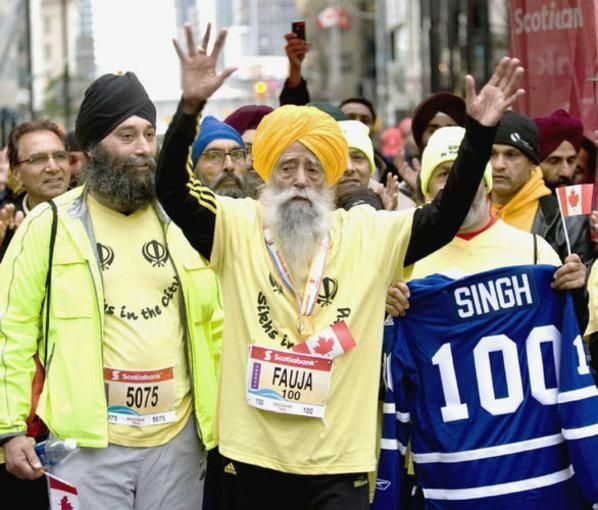 At 101 years old, Fauja Singh is a poster boy for immovable determination. At an age most people would like to just reach, the Indian-born Briton is running marathons. In fact he didn’t run his first marathon until he was 89, and has since smashed one world age-class record after another. His marathon record, for age 90-plus, is 5 hours 40 minutes, which he did when he was 92, at the 2003 Toronto Waterfront Marathon. Last year he became the first 100 year old to finish a marathon, in 8 hours 11 minutes. When he was 99, he had blood tests and a bone density test. Doctors, kept blind to the identity of their subject, felt they were dealing with a 40-year-old in the blood tests and as per bone density, he was found to be comparable to that of a 35-year-old ;). People might doubt his age, but Singh travels with a passport and with the telegram from The Queen which marked his 100th birthday. In 2004, he was featured in Adidas’ “Impossible is Nothing” campaign. He’s the subject of the authorised biography “Turbaned Tornado”, which he can’t read because he’s illiterate. His Facebook page has over 45,000 fans. Singh attributes his longevity and running abilities to his Punjabi vegetarian foods, a “carbloading diet“, reminiscent of the one we are proposing in preparation to endurance events. This guy is incredible and he never ceases to amaze me. I like to use him as an example that your age isn’t a disability either, only if you let it. Sure it can slow you down but it doesn’t need to stop you. Please talk about our own Canadian inspiration, Ed Whitlock, establishing records at 81.